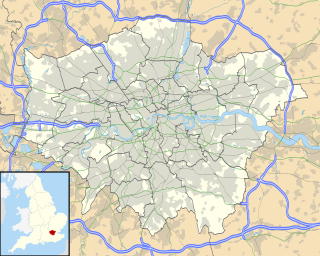 Walworth is a district of south east London, England, within the London Borough of Southwark. It is located 1.9 miles (3.1 km) south east of Charing Cross, near Camberwell and Elephant and Castle. Hasfield is a civil parish in Gloucestershire,England, and lies six miles (9.7 km) south-west of Tewkesbury and seven miles (11 km) north of Gloucester. It is situated on the west bank of the River Severn; as much of its land resides below the 50-foot contour, it is subject to regular flooding. Hasfield is represented by the county councillor for Severn Vale division and the two borough councillors for Highnam with Haw Bridge ward on Tewkesbury Borough Council. Thomas Rickman, was an English architect and architectural antiquary who was a major figure in the Gothic Revival. He is particularly remembered for his Attempt to Discriminate the Styles of English Architecture (1817), which established the basic chronological classification and terminology that are still in widespread use for the different styles of English medieval ecclesiastical architecture. James Piers St Aubyn, often referred to as J P St Aubyn, was an English architect of the Victorian era, known for his church architecture and confident restorations. High Orchard was an industrial area of the city of Gloucester in England that was developed in the 19th-century on the former orchard of the Priory of Llanthony Secunda (1136). The area was closely associated with Gloucester Docks immediately to the north and served by the Gloucester and Sharpness Canal and railway transport. It was the site of Fielding & Platt's Atlas Works and a number of other significant local employers. Twigworth is a small village near Gloucester in the Borough of Tewkesbury, Gloucestershire, England. The population of Twigworth Parish was 340 people in mid-2014 in 170 households. A planning application for 725 new homes in the parish of Twigworth was approved in December 2017. The Church of St Lawrence is a grade II* listed Church of England church in Sandhurst, Gloucestershire. The Severn Barrage refers to a range of ideas for building a barrage from the English coast to the Welsh coast over the Severn tidal estuary. Ideas for damming or barraging the Severn estuary have existed since the 19th century. The building of such a barrage would constitute an engineering project comparable with some of the world's biggest. The purposes of such a project has typically been one, or several of: transport links, flood protection, harbour creation, or tidal power generation. In recent decades it is the latter that has grown to be the primary focus for barrage ideas, and the others are now seen as useful side-effects. Following the Severn Tidal Power Feasibility Study (2008–10), the British government concluded that there was no strategic case for building a barrage but to continue to investigate emerging technologies. In June 2013 the Energy and Climate Change Select Committee published its findings after an eight-month study of the arguments for and against the Barrage. MPs said the case for the barrage was unproven. They were not convinced the economic case was strong enough and said the developer, Hafren Power, had failed to answer serious environmental and economic concerns. Beachley is a village in Gloucestershire, England, near the border with Wales. It is located on a peninsula at the confluence of the rivers Wye and Severn, where the Severn Bridge ends and the smaller secondary bridge for the River Wye begins, both bridges carrying the M48 motorway between England and Wales though the motorway is not directly accessible from the village. The tidal range on this stretch of water is the highest in the UK. Before the construction of the bridge it was a ferry port from where the Aust Ferry operated until 1966. Aust is a small village in South Gloucestershire, England, about 10 miles (16 km) north of Bristol and about 28 miles (45 km) south west of Gloucester. It is located on the eastern side of the Severn estuary, close to the eastern end of the Severn Bridge, now part of the M48 motorway. The village has a chapel, a church and a public house. There is a large area of farmland on the river bank, which is sometimes flooded due to the high tidal range of the Severn. Aust Cliff, above the Severn, is located about 0.5 miles (0.80 km) from the village. The civil parish of Aust includes the villages of Elberton and Littleton-upon-Severn. Lechlade, or Lechlade-on-Thames, is a town at the southern edge of the Cotswolds in Gloucestershire, England, 55 miles (89 km) south of Birmingham and 68 miles (109 km) west of London. It is the highest point at which the River Thames is navigable, although there is a right of navigation that continues south-west into Cricklade, situated in the neighbouring county of Wiltshire. The town is named after the River Leach that joins the Thames near The Trout Inn and St. John's Bridge. Ashleworth is a village and civil parish in the Tewkesbury district of Gloucestershire, England, with a population of 540, about six miles north of Gloucester. It has a riverside pub, the Boat Inn. The oldest part of the village is Ashleworth Quay, on a flood plain on the west bank of the River Severn. William Paty was a British surveyor, architect and mason working mainly in Bristol. He was appointed City Surveyor in 1788. He worked with his father Thomas Paty and brother John Paty. Thomas Paty was a British surveyor, architect and mason working mainly in Bristol. He worked with his sons John Paty and William Paty. Frederick Sandham Waller was a British architect and antiquarian of Gloucester, where he was the resident architect to the Dean and Chapter of Gloucester Cathedral. Christ Church is in Neston Road, Willaston, Cheshire, England. It is an active Anglican parish church in the deanery of Wirral South, the archdeaconry of Chester, and the diocese of Chester. The church is recorded in the National Heritage List for England as a designated Grade II listed building. Sidney Gambier-Parry was a British architect. James Medland was county surveyor for Gloucestershire from 1857–89 in which capacity he designed many of Gloucester's public buildings such as the grade II listed Tredworth Road Cemetery chapel (1857). Harold Stratton Davis MC (1885–1969) was an architect in Gloucestershire who specialised in churches, vicarages and rectories. He won the Military Cross during the First World War while serving with the Royal Engineers. The Church of St. Luke, High Orchard, Gloucester, was a Church of England church built and endowed by the reverend Samuel Lysons, rector of Rodmarton, who was also the first minister. Foscombe is a grade II* listed country house in Ashleworth, Gloucestershire. It was built around 1860 in the Gothic Revival style for the personal use of the architect Thomas Fulljames. Bristol Road in the City of Gloucester dates from the medieval period. It runs between Southgate Street in the north and Quedgeley in the south where it joins the Bath Road and the A38. It contains a number of listed buildings and other notable structures. Pitt Street in the City of Gloucester runs between the junction of Priory Road, Archdeacon Street, and St Mary's Street in the north and the junction of Hare Lane and Park Street in the south. Albert Estcourt was a builder in Gloucestershire in the 19th-century who with his brother, and later on his own, constructed a number of notable buildings in the county and across southern England. Southgate Street is one of the ancient streets in the City of Gloucester, so named because its southern end was originally the location of the south gate in the city's walls. The part beyond the gate as far as Severn Street was sometimes known as Lower Southgate Street. It runs from the crossroads of Northgate, Eastgate, Southgate, and Westgate Streets in the north to Bristol Road in the south. 1 2 3 4 5 6 7 David Verey & Alan Brooks. (2002). The Buildings of England Gloucestershire 2: The Vale and the Forest of Dean. 3rd edition. New Haven & London: Yale University Press. p. 105. ISBN 9780300097337. ↑ Severn Barrage; the phoenix and a flawed scheme? Clean Rivers Trust, 6 January 2014. Retrieved 28 March 2019. 1 2 Historic England. "3 & 4, Pitt Street (1245683)". National Heritage List for England . Retrieved 28 March 2019. 1 2 Jordan, Christine. (2015). Secret Gloucester. Stroud: Amberley Publishing. pp. 38–39. ISBN 978-1-4456-4689-3. 1 2 Historic England. "Foscombe (1340298)". National Heritage List for England . Retrieved 31 March 2019. ↑ "Domestic Occurrences", The Gentleman's Magazine, 1841, p. 644. ↑ St. Luke, High Orchard, British History Online. Retrieved 26 August 2017. ↑ Gloucester: Modern parish churches. British History Online. Retrieved 31 March 2019. ↑ Carne, Brian. "Thomas Fulljames, 1808–74: Surveyor, Architect, and Civil Engineer", Transactions of the Bristol & Gloucestershire Archaeological Society , Volume 113, 1995, pp. 7–20. ↑ Historic England. "Albion House (1271769)". National Heritage List for England . Retrieved 30 March 2019. ↑ Historic England. "Norfolk Buildings (1245993)". National Heritage List for England . Retrieved 27 March 2019. ↑ Architect plans by Thomas Fulljames. National Archives. Retrieved 28 March 2019. ↑ 1874 Probate Calendar, p. 161. ↑ Historic England. "Monument to Thomas Fulljames (1304042)". National Heritage List for England . Retrieved 27 March 2019.